Amethyst is a violet variety of quartz often used in jewelry. The name comes from the Ancient Greek ἀ a- (“not”) and μέθυστος methustos (“intoxicated”), a reference to the belief that the stone protected its owner from drunkenness. The ancient Greeks and Romans wore amethyst and made drinking vessels of it in the belief that it would prevent intoxication. It is one of several forms of quartz. Amethyst is a semiprecious stone and is the traditional birthstone for February. Amethyst comes in many varieties, from opaque to transparent, from pale lavender to deep purple. With veins, spiderwebs and other patterns. It is said that the deeper the color and the higher the transparency, the more expensive the stone. Price variations allow to create gorgeous jewelry in any price segment. With faceted stones, cabochons, tumbled chunks and even crystals. All combinations possible. With Mohs hardness of 7 amethyst is “relatively” easy to cut and polish for a hobbyist-silversmith. No special equipment is necessary, just cutting/polishing disks which can be used with a flex shaft/dremel. Mirror polishing possible with a cerium paste or powder. Though it is believed to be a birthstone of February, every Sun sign native who is a bit spiritual and believes in the healing power of gemstones can wear amethyst and feel its calming and soothing properties. It really helps against tension headache, anxiety and insomnia. The best way is to rub the amethyst crystal against the brow or the temples. And last but not least… Amethyst and silver are a match made in heaven! 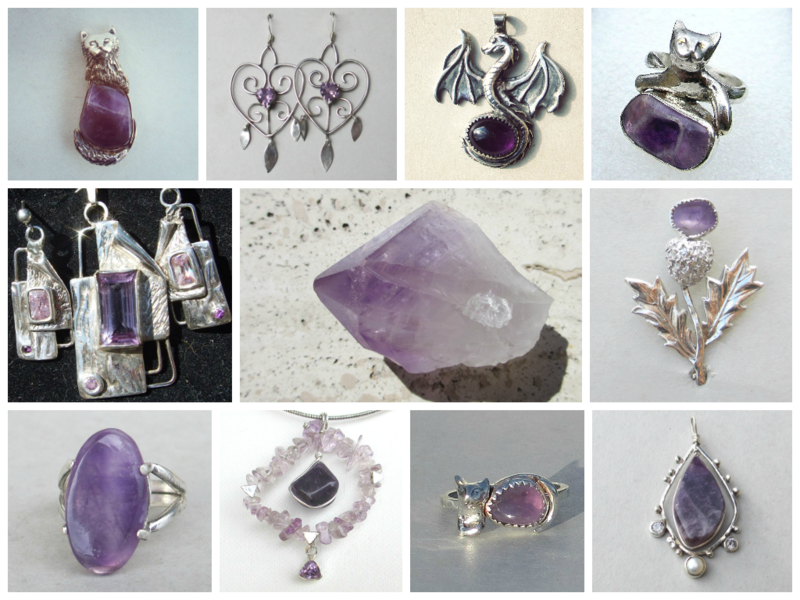 These are my amethyst creations throughout the years 2010-2014.